Jenks City Hall, 211 N. Elm St. 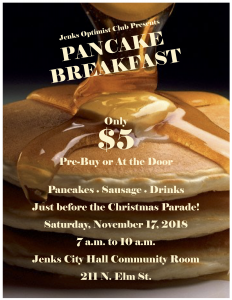 The Jenks Optimist Club Annual Pancake Breakfast will be right before Kiwanis Club Christmas Parade! For only $5, you get unlimited pancakes, sausage and drinks! 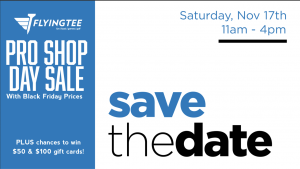 You can pre-buy tickets from a member of the Optimist Club. The breakfast will be at Jenks City Hall's Community Room, 211 N. Elm St.! The Jenks Kiwanis Christmas Parade, just a few days after Lights On!, helps kick off Christmas in Jenks! To participate in the parade, download the application here and return it to the Kiwanis Club.